PreGlide is an 8-level puzzle/logic game. The playing field is filled with colored blocks. You must slide the colored blocks around to try to get three or more blocks in a row. 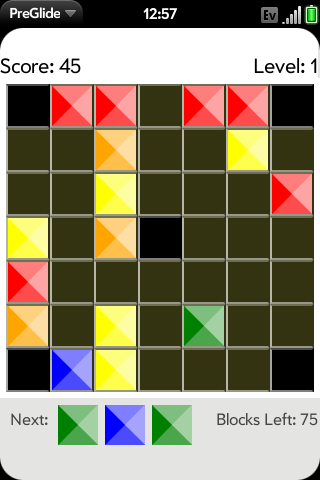 There are 8 levels in the game, as the levels get harder the playfield becomes more restrictive, and more colors begin to appear. Try to get as high a score as possible in 8 levels!